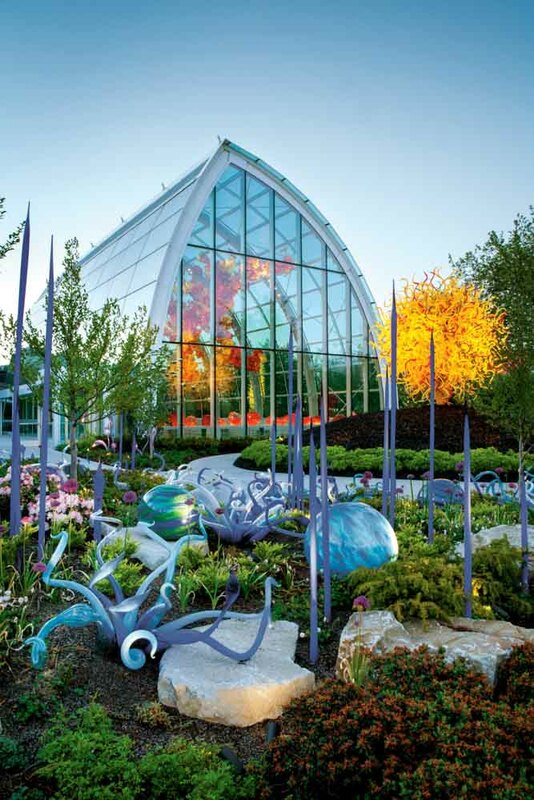 Check out Dale Chihuly's entrancing glass exhibition, it is a good way to spend a few hours in Seattle. The wonderful, organic shapes formed in glass by the artist Dale Chihuly at his namesake gardens and exhibition space in Seattle. Flower-like glass forms bloom across the ceiling at Chihuly Garden and Glass. 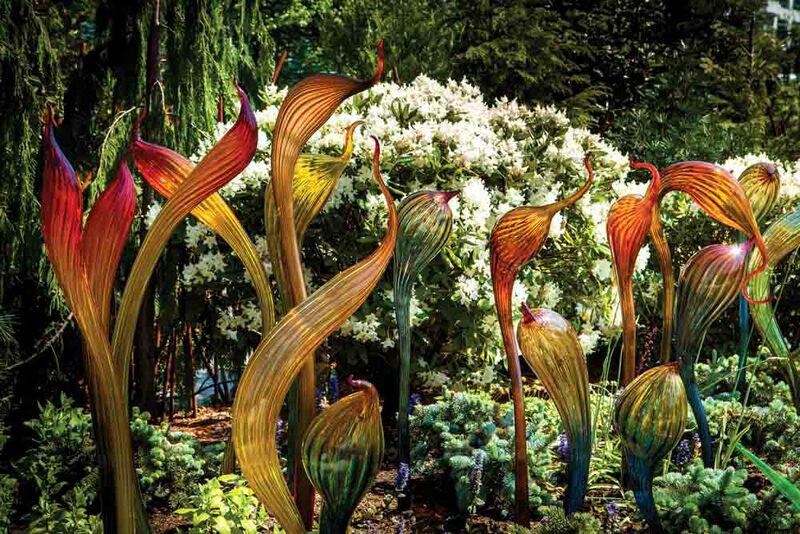 From wandering feet to behemoth boats, Chihuly’s Garden and Glass Museum is an out-of-this-world journey for a seriously quick Seattle stop-over. By Quentin Long. The city of Seattle doesn’t really conjure the most seductive of connections: Bill Gates, Seattle Sound, Boeing, Frasier and rain. But you can find a common thread among these icons: unconventional ideas. 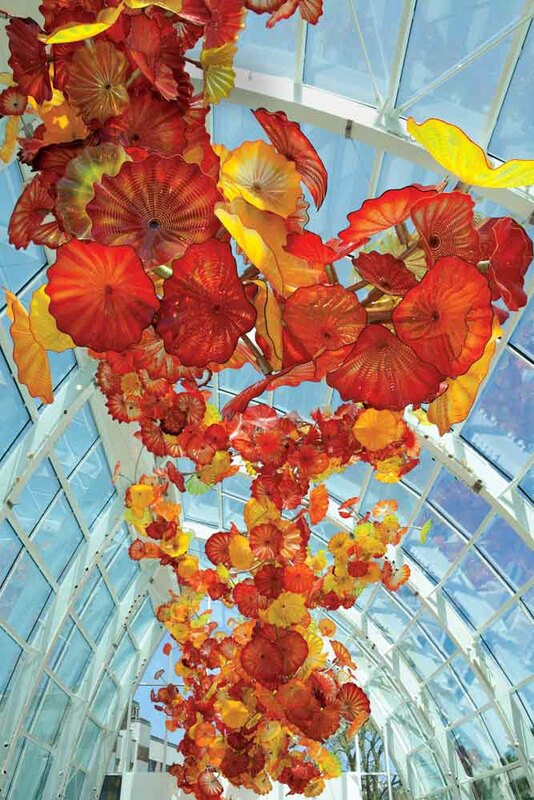 Dale Chihuly exemplifies the Seattle brand. A unique style has made him the greatest glass artist of the 20th century. His work is so revered that even the greatest glass masters in the world, the Venetians, requested he install his signature twirling chandeliers across Venice. So when faced with a three-hour gap before boarding an Alaska-bound cruise, I decide I have just enough time to discover Chihuly Garden and Glass at the base of the Space Needle. The 10 rooms and one garden are filled with Chihuly’s works. One of his earliest, Glass Forest, kicks off the adventure. Created by letting molten glass form its own shape when dropped from a height, a lot like honey off a spoon, and filled with neon, its simplicity belies what follows. His work increases in complexity and colour, from the simple baskets of glass based on indigenous wares of the Pacific Northwest to his most famous pieces, the chaotic chandeliers. The Mille Fiori room is perhaps the biggest crowd pleaser; every conceivable shape and form Chihuly made famous is represented; bulbous ‘seal pups’, long thin tubes and funnel-shaped flowers. Yet it’s in the garden where Chihuly really shines. Working for the first time with a garden designer, his pieces integrate seamlessly with the plants. The Collections Cafe provides a final insight, with many of Chihuly’s personal knick-knacks on display. And the food? Outstanding, and served in a timely fashion… important when you only have 10,800 seconds to spare.